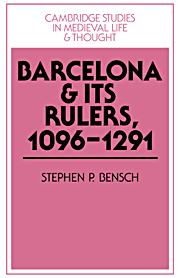 Based on extensive archival research, this volume examines the early growth of Barcelona in order to understand the causes of the European economic take-off. The city did not at first grow because of overseas trade but because of market-oriented agriculture and tribute from Islamic Spain. Only after a difficult adjustment did the city develop the commercial foundations that would later ensure its prosperity. Barcelona's patriciate rose to prominence during the second stage of growth, also a period dominated by a struggle for power in Catalonia. Here, the family structure of the patriciate receives close examination, and in general the volume challenges many traditional assumptions about the nature of Mediterranean towns. List of figures; List of maps; List of tables; Preface; List of abbreviations; Introduction; 1. The city and its region; 2. The city and its lord; 3. An aborted take-off: the urban economy in crisis, 1090–1140; 4. Urban society in transition; 5. The patriciate in gestation, 1140–1220; 6. Family structure and the devolution of property; 7. Consolidation and conflict: patrician power and Mediterranean expansion, 1220–1291; 8. Patrician continuity and family identity; Conclusion; Appendices; Bibliography; Index.